How to reset oil service light Saturn SW2. Switch the ignition to ON/Run, don’t start the engine. Open your Saturn SW2 hood. Now go in front of your car and remove the fuse block cover, as you sit with your face to engine the fuse block cover is situated on your right beside the battery, on the cover have this steps list, picture below. 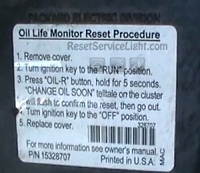 Now press and hold for about 5 sec the button OIL-R which means oil reset. See picture below. 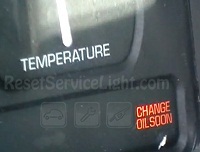 The Change Oil Soon indicator light will start to blink, you most wait until the indicator light will stop flashing. Switch ignition OFF and then start the vehicle to see if Change Oil Soon indicator light has been reset. That it is the full procedure how to reset oil service light Saturn SW2. If you like to reset any maintenance oil light after an oil change. Or reset check engine light, airbag light, inspection key or insp errors when maint reqd, for Saturn cars. Or any warning light for service reminder which appears on the display. Write in the search box the car name for which you want to find information, and find how to reset other service reminders by yourself. I have a Saturn 1999 the wrench light is on engine service soon how do I fix it. What model of Saturn do you have L-series or S-series? I have a 1996 SW2 and my wrench light has been on for the last two years with my change oil soon light out. I want to sell my car and get the light off so I won’t have any problems selling it. I found this site and went straight to my car, followed directions and saw that my fuse box does not have an “oil-r” button. Is there any more help you can offer? Thanks! Do you have a Saturn SW2 first generation or second generation ?